The Newest Rant: These Two Upcoming Comic-Events Actually Seem Appealing to Me, But Should What is Old be New Again? These Two Upcoming Comic-Events Actually Seem Appealing to Me, But Should What is Old be New Again? 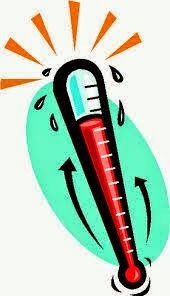 I've discussed in the past how I came down with a severe case of eventitis which I seem to suffer from to this day. Basically, it means I'm tired of the major comic-book publishers (especially the "Big Two" of Marvel and DC) doing supposedly important mega-events where it is bragged about how, "Nothing will ever be the same," and that of course only holds true in that nothing is ever the same, at least until the following huge mini-series a mere month later. This eventitis has resulted in me sitting-out such Marvel events as "Original Sin" and not reading anything that deals with "Axis" unless it occurs in a title I already pick-up. I also have been avoiding the multiple DC weekly titles (which I thought were absurd to begin with) and reading less and less of the publisher in general--excluding the occasional great mini-series or such. My being exhausted with events makes it all the more surprising that there seem to be two that actually looking kind of promising on the horizon--one from DC and one from Marvel. Also, the most interesting this about these events may be they are in a way both preying upon nostalgia for each respective publisher's past output, which kind of says something about how we view today's comics, possibly, doesn't it? Before discussing that let's address what these events actually are about though, shall we? Secret Wars/Remember That Event from the 1980's With the Same Name You Loved? Marvel's new "Secret Wars" so far sounds a bit like an alternate-reality story mixed with a big callback to the original highly-popular "Secret Wars" event of the mid 1980's. This will apparently be growing-out of what is happening in the Jonathan Hickman-penned "Avengers" comics where various earths from different realities have come into contact with one another, and if one isn't destroyed within a brief window of time both go kablooey. While relatively little is known about what "Secret Wars" will entail, a map of the, "Battleworld," that it will take place in has been released illustrating the various realities coming into conflict. 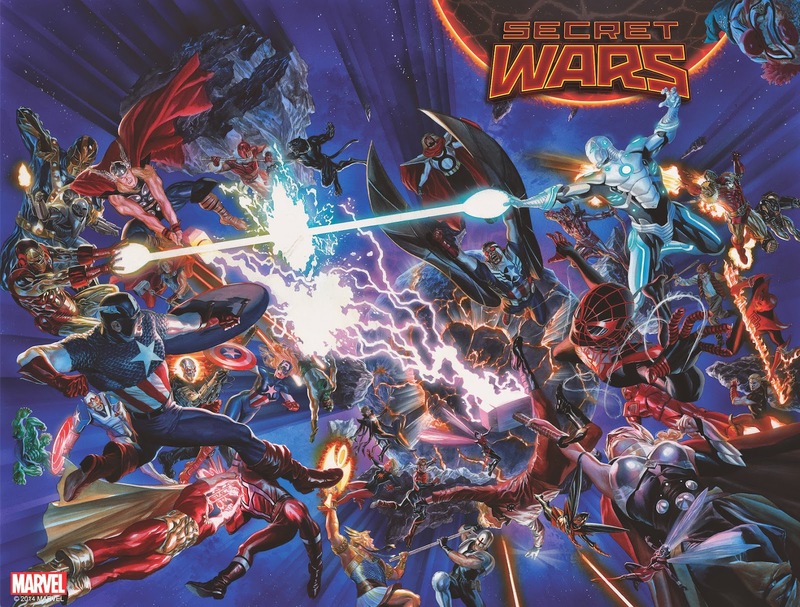 Also, it has been revealed all those random teaser-images for events Marvel was releasing do in fact directly relate to this "Secret Wars" business. With there being so little known about "Secret Wars" it is possibly a bit foolish to have any optimism about it, and yet here I am thinking that maybe Jonathan Hickman will write a great event full of alternate worlds interacting in cool ways. This whole thing could end up just being one big mess, but I have some hopes for it and may actually at least check-out the first issue, which is saying a lot compared to the utter lack of attention I've given any other recent Marvel event. DC's offices are making a big move out to California from NYC this Spring, and in order to still have an output of work over those two-or-so months that will be spent relocating everyone who wants to move, hiring new folk to replace those who wanted to stay put, and getting set-up, DC is having a having an event of sorts called "Convergence". This event is basically one nine-week-long mini-series (a rare occasion when an "event" weekly actually kind of makes sense for DC) with 40 other series that will last two issues each. That results in an admittedly HUGE event--clocking in at basically 89 issues total--but the wonderful thing about it is that you don't necessarily have to read every comic to enjoy "Convergence", it would appear. Basically, creative teams from the past who worked on comics from the 1980's and 1990's that everyone loved are coming back to do the two-issue mini-series with each comic possibly set in its own universe (or "bottle-Earth" if some rumors are to be believed). Therefore we will get to enjoy a Renee Montoya-as-the-Question comic written by the man who made Montoya the popular character she has been, Greg Rucka. To give another example, there will be a Len Wein-penned "Swamp Thing", to the joy of his fans, and so forth with all the minis. 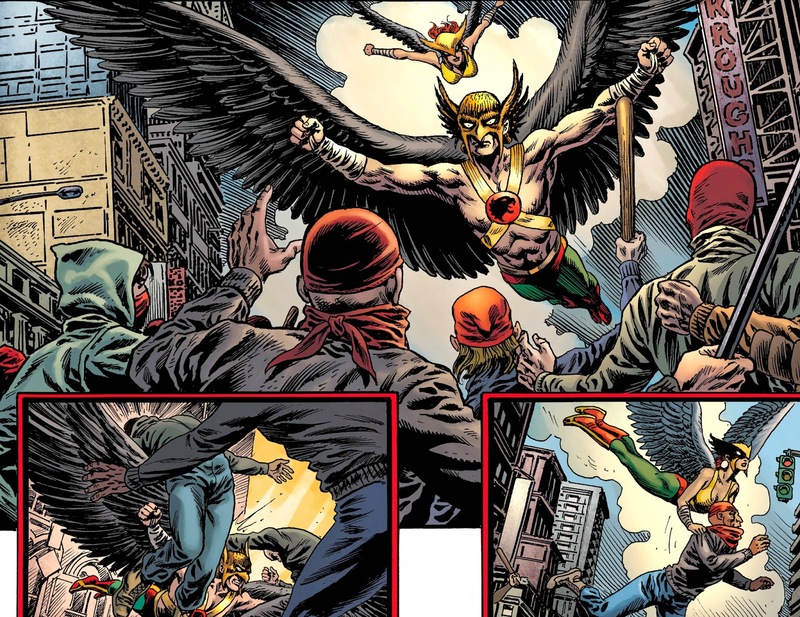 A "Hawkman" comic written by Jeff Parker? Neat! Yes, "Convergence" is the kind of event that actually sounds extremely appealing to me. It requires minimal-to-no knowledge of previous DC continuity but is extra fun for those who know their history, has an assortment of writers and artists who are skilled at writing/illustrating the characters, and most importantly of all actually looks like it might be fun as opposed to some of the more dour-themed events we seem to get lately. The odd thing about this "Convergence" event and the previously-discussed "Secret Wars" though is that they are new events, but drawing from old concepts--and is it worrying that it takes that to get me and others excited? 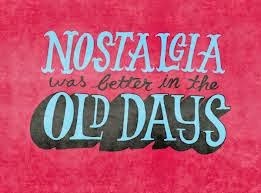 Should What is Old be New Again? "Remember when 'Fantastic Four' wasn't cancelled?" "Yeah, those were some crazy times!" 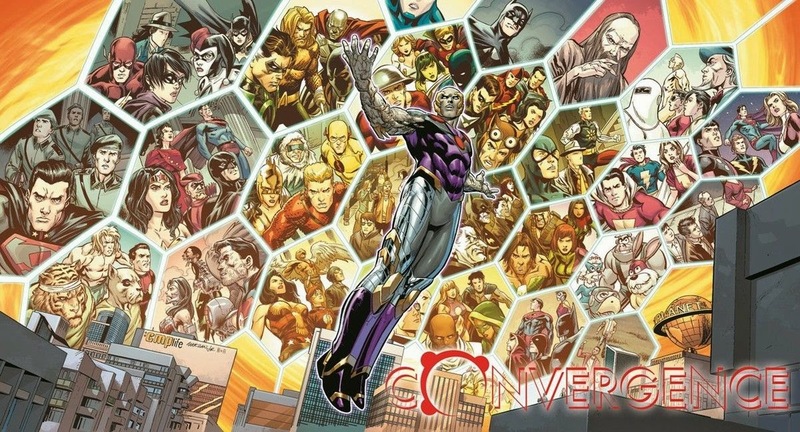 I have seen many comments on the internet in forums where people are saying DC's "Convergence" is going to get them to pick up a DC title for the first time in a long while. Because "Name" creator is back doing "Name" title, they now are finally interested in DC again. I've also seen some people remark that they hope this whole "Secret Wars" Marvel is doing will reset some of the more awkward story-decisions that have happened in the Marvel-Universe since whatever year they feel things went off track--e.g. 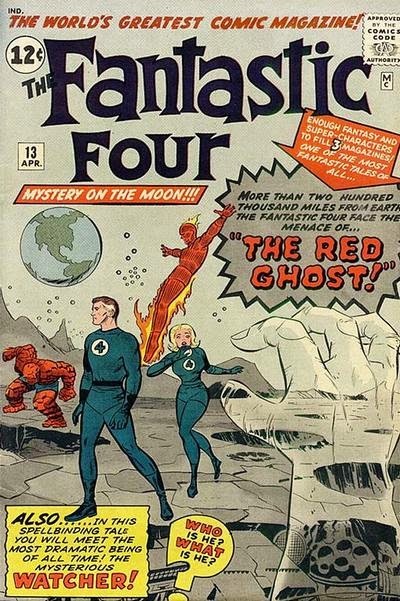 some people say to undo anything after "House of M" others say to simply eliminate "One More Day" and some folk just want to have a "Fantastic Four" comic to read. These comments are interesting and a bit worrisome. Think about this: many people who have been lambasting Marvel and DC for years are now happy that old concepts from the past are essentially being recycled and given to us with a newer-sheen but possibly less creativity. I admit I'm finally excited for a an event from the companies now, but how does that reflect on us, the fans? We constantly complain we want the, "Big Two," to come up with new ideas, heroes, or concepts--but when given the chance to have our urge for nostalgia stroked--even if just for two months by DC or merely having the idea teased by Marvel--we get all excited and say how pleased we are the companies are going back to, "Giving the fans what they want." Well, what in the dickens do, "The fans," actually want? Do we want new stories that make us irritated in how they change the heroes we love, or do we want tales more similar to what we remember liking, "Way back when," to satisfy us? We can't have both, and I myself am a victim of being contradictory. After all, I've complained DC wasn't creative enough in its "New 52" re-launch and should have taken more risks, yet I applaud them planning to release a bunch of comics that remind me of how things were pre-"New 52". I don't know what my point is in this article, I suppose. I can say how these new events look appealing, but then find as a counter to that the argument how I'm just overjoyed about more-of-the-same. I know I like new and creative comics, that's why I'm enjoying so much more smaller-press titles now. Then again, seeing heroes from stories I greatly enjoyed, "Coming back for more," also appeals to me, so perhaps like many human beings I am a mixture of desiring for stuff to be new whilst also longing for the return of older things I also treasured. Hopefully these upcoming comic events can fulfill both desires, giving readers something new and different, but also scratching that nostalgic itch. I suppose come Springtime we will see what happens.